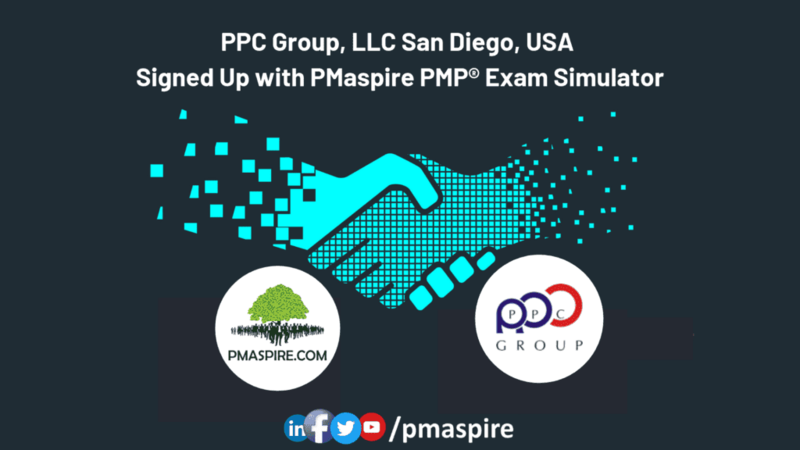 14 February 2019 – PPC Group, LLC ( www.ppcgroup.us) one of the leading Project Management Education Provider in San Diego, USA has partnered with PMaspire Singapore PTE. Ltd (www.pmaspire.com), for PMBOK® Guide Sixth Edition PMP® Exam Simulator. PMaspire, learning management software for Project Managers is called PMP® Exam Simulator. This simulator helps the project managers to learn complexities of project management through online simulation, practice knowledge area by knowledge area/process group, practice flashcard, simulate PMP® exam on realistic simulated environment with detailed justification of each situation with PMBOK® Guide Sixth Edition page reference etc. More than 100+ PMI® Chapters, PMI® REP’s and PMP® Trainers are using PMaspire PMP® Exam Simulator and increasing their student & organization’s performance significantly. With over 35 years of project, program, and portfolio management (PPPM) experience, PPC Group LLC helps organizations and individuals improve and sustain growth through implementation of continuous improvement of PPPM. We do this through strategic planning, continuous improvement, business process improvement (BPI) and training, aided by publications and technology. We focus on scalable frameworks, discipline, and results you need to reach the next level.